1) Since leadership council ended in May, I've been doing this solo. This was always a project I wanted to do in a group, in community - not in isolation, like so many of our other professional endeavors end up being. Yet many of the folks who I might think about asking to join me in leadership are deeply involved with other projects or endeavors and don't have the time or energy to add this on. 2) I'm not sure the project is serving the community in useful ways that are worth continuing. I base this on blog readership (which is steady but low) as well as the fact that so many of you are already doing great, social justice / anti-oppression based work in other groups and settings. It's not clear to me what additional value TJP brings beyond that. 3) I myself have been quite busy with other projects, primarily Beyond the Bridge which many of you know about, as well as consultation on a national project to bring effective couple therapy approaches to veterans. In light of these and other factors, I have been leaning toward bringing TJP to a close - feeling as if, while it served its purpose for a time including bringing together many people who might otherwise not have met, perhaps it has lived its course. However, there is something about this project that I still find very compelling and am not quite ready to let go of. So, as a compromise between continuing as is and ending it altogether, I've decided to take a several month TJP vacation between now and the end of the year. This means I won't be posting blog articles, Facebook posts or organizing retreats. This break will both give me some time to finish up some other pressing projects and allow me to sit with what makes the most sense for me and for TJP. What I am hoping is that, toward the end of the year or beginning of the new year, we can have a mini (maybe half-day) retreat in which any interested parties can check in with one another as a group, and see what there is energy for to work on in community. "Energy" might be as simple as getting together periodically to discuss the work we're doing and support one another, or it might be more involved than that. If, when we touch base, other folks are not able or interested in engaging with me as part of TJP, I will be able to put it down with peace in my heart, and continue to pursue this work in other ways. If there is energy to collaborate and move forward, that will be exciting and we will do so... until TJP and the needs of our group change yet again. So, I wanted to let you all know why you won't be hearing from me (at least in TJP capacity) for the next few months. I hope this makes sense and of course welcome any thoughts or comments you might have. I know this network of now 150+ people is deeply committed to, and already engaged in, work toward positive social change and redressing social inequities. If there are ways that TJP as a community can continue to serve that overarching goal, then great. If not, it has certainly been a great pleasure and honor to have done what we have in the last 3 1/2 years. Picasso once said that “art is a lie that brings us nearer to the truth”. So true, but sometimes art also tells us the truth in ways that other media can’t. During my trip to Washington, DC this past week I had occasion to witness some difficult, beautiful, challenging, inspiring and visionary truths about social justice reflected through the visual arts. There are many ways to look at issues of social justice in the arts; for simplicity I will focus on the following three: inequities in the arts, social justice depicted through art, and art as social justice activism. Inequities in the arts. While in DC I stumbled upon a lovely museum entitled the National Museum of Women in the Arts. I’ve been to DC many times, and yet have never heard about this wonderful museum, and I find it interesting that it has not been highlighted, or at least not prominently so, in guidebooks or local travel guides. Turns out it’s (from their website) “the only museum in the world dedicated exclusively to recognizing the contributions of women artists”. Though it is on the small side compared with some of the gigantic Smithsonian collections, it’s a treasure trove consisting of both permanent collections and special exhibitions. Its history on the website explains that the museum was a direct outgrowth of discourse beginning in the 1960’s regarding the underrepresentation of women and artists of color in museum collections and major art exhibitions, with two female curators taking it upon themselves to begin remedying that, at least with regard to female artists. Unfortunately the stories of many artists of color follow a similar trajectory: difficulty obtaining education in the arts, underrepresentation in major collections and exhibits, and when they are shown, primarily being shown in separatist collections of African American art, Latin American art, Asian art, etc. See this article for an excellent discussion of exclusionary practices in the visual arts. The same is true in other media such as poetry and prose; see for example this 2007 report entitled Free Verse which found that less than 1% of published poets were Black or Asian. What will it take for women, people of color, uneducated artists and other under-represented groups to be fully recognized and given equal opportunity by curators of major museums and exhibits, publicists, and other gatekeepers to the art world? Meanwhile, young people, aspiring artists and adults who are not members of dominant (white, male, owning class) groups will not see their experiences and artistic visions fully reflected in the major collections of art around the world. Although the revisionist approach of a “gallery of women in the arts,” “gallery of African-American art,” etc. is better than nothing, as is true in other areas of oppression separate is still not equal. Struggles for social justice depicted in art. 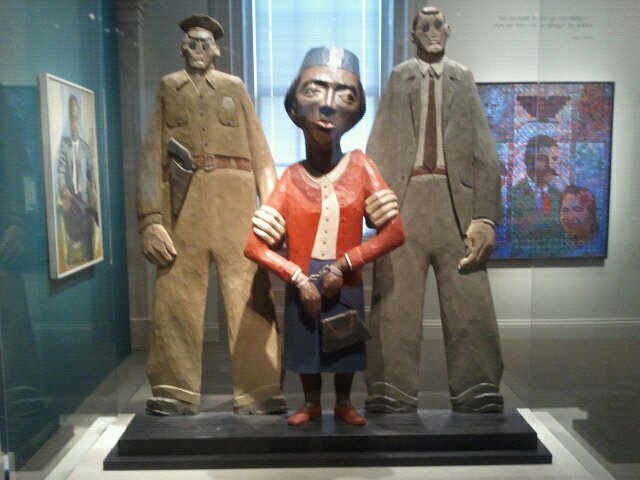 On another day, in another gallery - the Smithsonian National Portrait Gallery - an exhibit entitled “The Struggle for Justice” blew me away. This permanent collection is filled with images (including paintings, photographs, and sculpture) depicting the struggle for social justice for many marginalized groups, focusing in particular on efforts to overcome racism, sexism, homophobia, and ableism. Some of the images were familiar, even iconic - a contemplative Martin Luther King, Jr., for example, and a portrait of feminist and NOW founder Betty Freidan - while others depicted their message with a new vision, such as the beautiful painting of Eunice Shriver, founder of the Special Olympics, with five special Olympians, all on a beach and gazing together toward the horizon. The image of Rosa Parks carved in wood (pictured at the top of this article) depicts her courageous and historic act of civil disobedience with power and substance. You can view the entire exhibit here, and this wonderful website also contains lesson plan suggestions for utilizing the exhibit as a teaching tool. Although not named as such, the gallery of Pulitzer Prize winning photographs at the Newseum was another place where social justice struggles were vividly depicted. Hundreds of historic moments captured on film in this collection include the Kent State massacre, a confrontation between Jewish settlers and Israeli security forces, and the collapse of the Berlin Wall. Viewing their work in this gallery made me want to laugh (I did, out loud, several times), cry, and got me really, really mad, all at the same time. The list of actions they have taken in their 25 years of existence is incredible. Here is their website, in case you want to learn more. There is so much to say about art and social justice, and I am just touching on these rich and complex issues. An excellent book delving into this topic is Art and politics now: Cultural activism in a time of crisis by art critic (and Seattle resident!) Susan Noyes Platt and available for purchase on her website. The book covers topics including racism, immigration reform, environmental crises, and opposition to war and examines the various ways that individual artists, collectives, curators and exhibitions participate in social commentary and political activism. For now I will just say that I was moved by my brief tour of social justice in the arts while in Washington, DC - saddened and angered by the deep inequities persisting in the art world, but also struck by the power of art to illuminate stories and issues of social justice. Many have written about the importance of engaging affect when doing work on oppression and privilege; art has the power bypass rationalization and higher cognitive functioning to deliver a deeply affective experience and show us the truth. I am on a plane headed to the annual convention of the American Psychological Association, dubbed by fellow psychologist Laura Brown (who is also on my flight) “summer camp for psychologists”. A gathering of over 10,000 psychologists with diverse interests and careers from around the world, the event is usually stimulating and exciting, a shot in the arm to keep doing clinical work and advocacy, a chance to hear new viewpoints, learn new interventions, and socialize with friends and colleagues. This year the convention is being held in Washington, DC, which normally would also cause great excitement for me; I love the city’s history, museums, monuments, and buzzing sense of political life going on all around. But right now, like many Americans, I feel a huge sense of conflict, disappointment, and wariness about the workings of our government. The debt ceiling has just (literally, in the last 24 hours) been lifted, but the sigh of relief that accompanies this is small, offset by worries about the still impending possible cuts to basic lifelines such as supplemental Social Security income and Medicare, as well as by witnessing the bitter, polarized partisan debate that led to this unsatisfactory and temporary resolution to the budget crisis. Going to APA in Washington, DC brings together in one place, in one weekend, three things I am passionate about and deeply committed to: psychology, social justice, and political activism. Yet this year, instead of excitement, I feel wary, weary, angry and, to bring a psychological term to bear, some learned helplessness about our country, where we’ve been and where we are going. Here are some of the pieces that go into that unsettling mix. 1) The gap between the super rich and the poor and middle class is more extreme than it’s been in almost a century. The richest 1% of Americans earn nearly 25% of the country’s income and control a whopping 40% of its wealth. Meanwhile, with unemployment at 9% for the population overall the partisan budget debate has threatened to cut some of the most basic safety net programs that help keep the nation’s most vulnerable, including the poor, the elderly, people with disabilities and the unemployed, afloat. Although some of those programs were spared during this go-around, the threat of draconian cuts still looms ahead during the November “super committee” negotiations. Was this just a postponement of the inevitable? 3) Once an individual becomes unemployed, it is more difficult than ever to get rehired. For example, this article describes an investigation into systematic discrimination against unemployed job seekers that was called for by members of Congress and conducted by the Equal Employment Opportunity Commission (EEOC). The message “the unemployed need not apply” is at times explicitly stated on job announcements, and even when it’s not, many job seekers report verbal rejection after a recruiter or employer earns they are currently unemployed. 4) Employment barriers for people of color who are jobless are even higher. Black and Latino workers are typically the first fired in an economic downturn. White high school dropouts are twice as likely to find work as similarly uneducated black men, and even college-educated black Americans are far more likely to be unemployed than their white peers. Also, since African-Americans, older workers (especially women), and disabled workers have higher rates of unemployment during this downturn, discriminating against unemployed people likely hits these groups particularly hard. So much so, in fact, that the same EEOC panel that is investigating discrimination against the unemployed has also been tasked with investigating whether this discrimination is illegal because it disproportionately targets people of color and other groups that are specifically protected by antidiscrimination laws. 5) A report by UBS economist Paul Donovan indicates that there is a strong correlation between social inclusion, healthy competitiveness and economic development. On the flip side, his report also indicates that a prejudicial society is more likely to have difficulty recovering from economic hardship than one that is non-discriminatory and equally empowering to all of its citizens. He argued that "A prejudicial society is likely to deny its labor, its workforce, the potential to develop – access to education, access to jobs" and that “prejudice, in whatever form – including racism, sexism, homophobia, religious intolerance – irrationally destroys the value of human capital." What would happen, he asks, if someone whose mind holds the answer to one of the biggest problems facing the human race, such as climate change, energy efficiency or food productivity, was denied the ability to develop due to his or her ethnicity, religion, or sexual orientation? This is just one example of the many, many ways in which prejudice hinders the enhancement of human capital. Of course there are daily, less dramatic examples in the lives of people who are denied equal access to education, wealth accruement, housing, employment, and other resources required to survive and thrive. 6) That distinction between surviving and thriving is an important one. What we are talking about here is not just the inability to achieve a comfortable, middle class existence, but about people in disenfranchised groups dying, whether by ill health or suicide, at disproportionately higher rates, and as a result of poverty and joblessness. Here are two powerful articles, the first on the relationship between poverty and other social conditions and US health related deaths, and the second linking poverty to suicides. The first study found that poverty, low levels of education, poor social support, health insurance status, experiencing racism and discrimination, and other social factors account for about as many deaths in the US as heart attacks, strokes, and lung cancer combined. The investigators provide estimated number of annual deaths attributable to each social cause, but note that these numbers were likely an underestimation as they did not account for the compounding effects of numerous factors (low education plus racism plus low social support, for example). The second study indicates that suicide rates increase during times of economic hardship, with several likely mediating variables including unemployment, personal financial stress, and previous suicide risk. This relationship is true not just in the US, but also has been observed in other countries including Greece, England and Japan, as well as in Europe, but I do not know whether the underlying racial disparities that contribute to unemployment and suicide risk are similar in those countries. 7) Despite all of the evidence regarding systemic oppression at every level including education, employment, healthcare, wealth accrual, the criminal justice system, etc. etc., the myth of meritocracy is still being touted by some. For example, Oklahoma state representative Sally Kern recently stated that “it's character that ought to count, not whether you're white or black... it should be your willingness to say, 'I'm going to become everything I can become’.” Kern was blithely promoting the myth of meritocracy, or its flip side, the “culture of poverty”. This argument, often used by conservative politicians to justify cuts to social program spending such as food stamps, maintains that poverty in communities of color is due not to systemic oppression or economic factors, but to a deeply rooted intrapersonal flaw that holds them back. They are simply not working hard enough, the myth goes, and/or are too dependent on governmental assistance to be motivated to succeed. This article soundly debunks the myth, yet it prevails in both media and government discussions, including in the recent pernicious budget debate. 8) Meanwhile, as the poor (and in particular poor people of color) continue to get poorer, the rich keep getting richer. Top executive salaries soared in the last two years (article), a 23% gain since 2009, while the average American’s wages went up just 0.5 percent from 2010 to 2011 (which, after correcting for inflation, means that average American is actually earning less than the previous year). Just to make this picture a little bigger (and worse), this article indicates that, unlike previous times in history, at this juncture economic recovery is not adding up to job growth. So, while CEO’s and some companies are starting to show signs of recovery, job growth- and hence financial health for the majority of Americans - is not following suit. What is one to do with all of this depressing news? In particular, as a psychologist, I am wondering what I can do about it? Perhaps you are wondering the same thing. I have just a few ideas, and they feel small in the face of the overwhelming difficulties our country is facing. When working with clients, it is crucial for us to try to assist them in making accurate attributions about experiences they may be having. People who are unemployed struggle with feelings of worthlessness, inadequacy, difficulty fulfilling roles (as father, mother, provider) as well as the stress associated with financial hardship. Help broaden their lens of analysis to look at the bigger picture, including how ethnicity and other social group memberships play into disparities in education, employment, and wealth accrual. Whether working with people of color or white individuals, articles on slow job growth, unemployment rates, and discrimination against the jobless can be helpful. This is not to make clients feel hopeless; quite the contrary, this broader ecological perspective can help them feel hopeful that this situation they find themselves in is not their fault. If we simply tell people to try harder, we are promoting the myth of meritocracy ourselves. Give at least some of your time to pro bono or low fee services. Join a group or listserv to stay informed (the Psychologists for Social Responsibility Poverty and Inequality Project is one such group). If you are an educator, help find ways your department can make higher education more accessible and affordable to more students; also help your students become aware and involved in community issues such as poverty, homelessness and oppression. If you have other ideas, I welcome your comments here, and if I am inspired by other ideas as I attend the APA convention in our nation’s capitol this weekend, I too will post them. Therapeutic Justice Project is a multidisciplinary collective of healers, advocates and activists dedicated to social justice. Our vision is to integrate social justice with health and mental health services at all levels including psychotherapy, service delivery, professional development, community/organizational support, and systemic change. In psychotherapy, our mission is to develop and implement a model that moves clients from unconscious to conscious, from an individual to a societal perspective, from depression and helplessness to activism and empowerment. We also aim to integrate therapeutic healing within social movement work. Socially, our intention is to make systematic change through community organizing, policy change, transformative dialogue, education, and special initiatives. For TJP flyer, click here. We cannot allow public discourse on art to remain, by default, dominated by the conservative agenda of repression. The future of society as a whole is once again on the line. Click here for an archive of quotes and poems we have posted on the blog or at retreats. Members of Congress are proposing substantial cuts to Medicare, Medicaid, and Social Security in order to reduce the federal deficit. Instead of restoring taxes on the wealthy which could provide increased revenue, they are proposing cuts to the safety net to our country's most vulnerable. Call on congress to reach a budget agreement that will protect programs that disproportionately serve women, the disabled, the elderly, and people of limited means. Please sign this petition to strengthen social security, not cut it. Beyond Inclusion, Beyond Empowerment - now available!!! The long-awaited book Beyond Inclusion, Beyond Empowerment, from Olympia’s Dr. Leticia Nieto, provides a breakthrough in the fields of liberation and cultural studies. It presents a powerful analysis of the psychological dynamics of oppression and privilege, and shows readers how to develop skills to promote social justice. It includes personal stories, exercises, visualizations and poetry. The book has roots in developmental psychology, theater, and liberation pedagogy. It was developed through collaboration among Leticia Nieto, Garth R. Johnson, Liz Goodwin, Margot Boyer, and Laurel Collier Smith. Beyond Inclusion, Beyond Empowerment is now available on Amazon.com, and Elliott Bay Books. More information is online at http://www.beyondinclusionbeyondempowerment.com/. The Fremont Community Therapy Project, a feminist, multicultural, queer-friendly, trauma-oriented clinic offering high-quality, low-cost psychological services is in need of assistance. While we are open for new assessment requests, we are currently experiencing a huge influx of requests for psychotherapy, to the point where we now have a 12-week wait list for psychotherapy. We would like to be able to refer folks on this list, if possible, so that people are not stuck waiting for care for three months. Most of the people who seek our services have a complex trauma history. Thus, we are looking for therapists who share our values, and who would be willing to accept the referral of a person who you would see at our fees, which range from 20-45/session. Most of them require a longer-term commitment from a therapist (typically people remain at FCTP for up to four years). If you're willing to accept a referral from us, please contact Laura Brown, FCTP Director, at 206-633-2405 ext 1, or email Laura at lsbrownphd@cs.com.